This isn’t just any meatloaf! 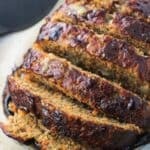 This recipe for balsamic meatloaf is juicy and moist, and features sauteed onion, zucchini, and carrot in the mix. It’s topped with a balsamic vinegar and ketchup glaze that caramelizes as it cooks for a ton of flavor. Add olive oil to a skillet set over medium-high heat. Add zucchini, carrot, onion, garlic, and a good shake of salt and pepper, and cook for 4-5 minutes, or until vegetables are slightly tender. Remove from heat and let cool while you prep the rest of the recipe. Preheat oven to 400°F. Line a rimmed baking sheet with parchment paper and set aside. In a large bowl, add eggs and lightly beat. Add ground round, ground pork, panko, Worcestershire sauce, parsley, Parmesan, 3 tbsp ketchup, and 3 tbsp balsamic vinegar. Add sauteed vegetables and mix everything together. Form the mixture into a loaf on parchment-lined sheet. Make sure you firmly pack in the loaf to help it stay together. In a bowl, whisk together remaining 3 tbsp ketchup and 3 tbsp balsamic vinegar. Brush onto the meatloaf. Bake for 1 hour 15 minutes, or until the center of the meatloaf reaches 160°F and is no longer pink inside. Let meatloaf rest for 10 minutes before slicing and serving. The consistency of the meatloaf should be similar to that of meatballs. It should hold together in a shape but not be crumbly or easily fall apart. If your mixture is too wet, add additional panko breadcrumbs until it reaches the right consistency. If it's too dry, add a little extra ketchup.